The Gran Loggia d’Italia has always felt the importance of international bondings, even before assuming its current institutional form. In fact, right after the scission from the Grande Oriente D'Italia, the acknowledgement the then Institution of the Ancient and Accepted Freemasons received from the Supreme Council of Belgium in 1908, was a support of utmost importance. In that occasion, the Supreme Council , led by Saverio Fera, was officially recognized as the legitimate heir to the original Supreme Council of Italy, founded in Milan in 1805. Such recognition was then extended to the entire Obedience first at the International Congress of the Supreme Councils in Washington in 1912, and then at the Congress of Lausanne in 1922. It was the leadership of Giovanni Ghinazzi (1962-1986) that set the final record to the creation of the Obedience international ties. In fact, in 1962, when the Obedience took its national seat at Palazzo Vitelleschi, the Gran Loggia d’Italia entered the C.L.I.P.S.A.S. and became one of the most active Obediences in the CATENA, the international organization which acknowledges women the right to affiliate to freemasonry. Giovanni Ghinazzi was an unwearying advocate of freemasonry as a united and inseparable family, free of any geographical limitations. During his long mandate, several international ties were intertwined, which have led the way for the creation of strong bonds with the main masonic institutions of the world, which today account for more than 130 treaties of friendship with liberal and adogmatic masonic obediences of 50 different countries. 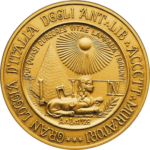 In 1998 the Gran Loggia d’Italia was among the masonic Authorities which founded the S.I.M.P.A., acronym of the Secrétariat International des Puissances Maçonniques – i.e. International Secretariat of the Adogmatic Masonic Autorities International Secretariat of the Masonic Adogmatic Powers-, based on unconditioned freedom of consciousness and pursuing a relentless fight against any dogmatic limitation, sectarianism manifestations and ideology denying human dignity, featuring an absolute faith in the principle of equality and aware that democracy and secularity are the necessary pillars of a political society. The Gran Loggia d’Italia was among the founding Authorities of the C.L.I.P.S.A.S., acronym of the Centre de Liaison et d’Information des Puissances Maçonniques Signataires de l’Appel de Strasbourg – i.e. Centre of Liaison and Information of Masonic Powers Signatories of Strasbourg Appeal -, an international masonic organization born on the initiative of the Grand Orient of Belgium on January 22nd 1961, when, together with the major European Obediences, including the Grand Loggia D'Italia, it launched an appeal to all freemasons to adhere to a CHAIN based on a total freedom of conscience. The C.L.I.P.S.A.S. has been officially acknowledged as NGO and participates in the United Nations Economic and Social Council – a.k.a.ECO.SO.C. - where it can nominate its representatives within this assembly at the UN seats of New York, Wien and Geneva. As of today, this important masonic association accounts for 64 Obediences, which represent all the liberal continents. Naturally allegiant to its esoteric tradition and contents, in 2001, the Gran Loggia d’Italia created a Chain of Union bonding the Obediences of the countries in the Mediterranean area, with the aim to study and rediscover the sources of the initiatory tradition of the Mediterranean sphere, since the dawn of time a true crossroads of cultures and peoples. This is how the Unione Massonica del Mediterraneo - acronymed U.M.M., i.e. Masonic Union of the Mediterranean - was born. As founding member, through this institution, the Gran Loggia d’Italia has always desired to promote fruitful exchanges among countries with different cultural backgrounds, with the purpose to contrast misjudgment and ignorance, which are, inter alia, frequently source of the dangerous religious fundamentalism, ever more present in the world of today.